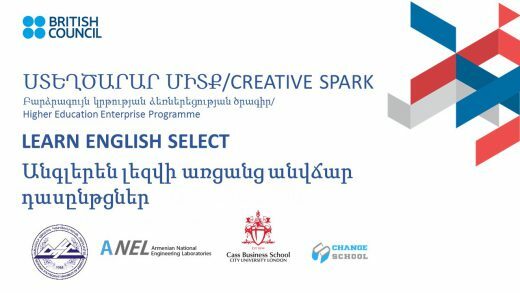 Armenian National Engineering Laboratory of National Polytechnic University provides English language free online courses developed by the British Council within the framework of the British Council “Creative Spark” Higher Education Enterprise Program. The courses are designed for both beginners and for those with a certain level of English. Only the Branch students, lecturers, or administrative staff representatives may apply for the course participation. The program delivers enterprise skills training packages to students and creative entrepreneurs. Hurry up to apply, places are limited. You will be notified in advance of being included in the program by e-mail. Creative Spark: Higher Education Enterprise Programme is a five-year initiative to support international university and institutional partnerships to develop enterprise skills and creative economy across seven countries in Central Asia (Kazakhstan, Uzbekistan, Kyrgyzstan), South Caucasus (Azerbaijan, Armenia, Georgia) and Ukraine through UK support. You can find more information at https://www.britishcouncil.am/programmes/education/creative-spark. The program is supported by the British Council.